Two seconds from impact, and all I can think of is "Is this it?" A few minutes after 12 noon today, July 24, 2011, as I was riding a jeepney from Katipunan to UP, I was looking at a white L300 van going on full speed towards the jeep I was riding as we were making a left turn towards UP. Then it was all a blur. Sounds of metal hitting each other, aluminum twisting and glass breaking. It was as if time stood still for a brief moment. I remember being thrown on the floor, a hand or an elbow hit my left eye, and I felt weight on top of me. And my first thought was: I AM ALIVE! And then people started crying. Someone said, "I can't move". And then a young woman cried "There's blood on my head." There were a number calling for help, my self included. Then, I tried to feel my head for any blood. There was none. Feeling that I can move, I tried going down and called for help. I wanted to be out of the way, feeling that I was ok. Standing in the center of the highway, I tried to remember my name and tried to form one sentence. Since I can remember my name, and the sentence I formed sounded coherent to me, I concluded I don't have any damage to my head. I tried feeling my other body parts, but there was no wet spot. My hips are sore for hitting the floor, and my left eye was sore too, but that was it. I think I am OK. I looked at the other guy who went down also, he seemed OK, no visible wound or blood. People started coming, calling for taxis and other vehicles to carry the wounded to the UP Infirmary which is only a few minutes away. 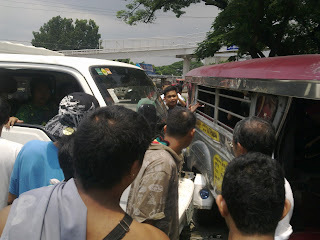 When all those who are wounded were brought to the Infirmary already, I went back to the jeepney and joined the other onlookers. The damage to the jeep isn't much, but during impact, it felt like it was totally crushed. I took some photos, and decided it was time to leave. There was nothing else I can do. I decided to walk a bit inside UP. While walking, I was able to reflect on a few things. First, if this happened in Commonwealth Avenue, I doubt if I would have survived. The van would have been running faster and the impact would have been greater. Second, I was lucky to be sitting where I was sitting at the time of impact. I saw the van as it was approaching us up to the point of impact. The lady in front of me was directly at the point of impact, and she was bloody. And most of those who were serious (as per my amateur assessment) were sitting on the right side of the jeep. Third, almost everyone would agree that a lot of drivers in Metro Manila are not worthy to be issued a divers license. And yet how many of us are acting on it? When do we stop complaining and start doing something about the problem? How many accidents would have to happen for us to say, enough is enough? Does the victim have to be someone close to us for us to act? Then maybe it's too late. Fourth, I found my immediate reaction amusing. Two seconds before impact, and all I can think of is "Is this it?" This is in contrast to my reaction a few years ago when I was also in the face of death.I wrote about this experience here, but looking back, I remember being angry. As a gun was pointed at me, I was asking, "Why me?, Why now?, Why this way?" But this time I felt ready. And I guess this is because after the first incident, I made an assessment of my life and made some drastic changes. I quit my 8-5 job to spend more time with my family, friends and in doing the things that I love. I traveled more, love deeply, forgave easily, held no grudges against anyone, and basically try to go to bed every night being at peace with the fact that tomorrow is not guaranteed. And lastly, this experience has again made me reexamine my life. Am I in a point where I want my life to be? Can I really afford to give up everything at this point to pursue the love of my life who is at the other side of the world? Do I really want to? Questions that I need to answer, and soon. But as for today, let us celebrate life. It may be short, but we can definitely make it sweet. I hope you are really ok. stay safe! Can we meet so I could see if you really are ok?